I’m not sure about you but I can’t help myself. I tend to collect things. Shoes, boxes, bags, um…camera equipment. And with the camera equipment comes more bags. Storage and portability is probably one of the biggest challenges that photographers face and don’t realize it until they are knee deep with equipment. One of things I’ve been struggling with lately is finding what I’m looking for as I have a bad habit of putting things in different places with no rhyme or reason. And then when I want grab something quickly it ends up being a search. I have a great backpack that I like by Evecase which is tough and amazing how much can fit into it. I prefer backpacks that open up on the outside, not on the back and I like lots of pockets and the waist belt is essential when carrying the weight. Right now I have two of them as a buckle broke on one of them and the vendor was kind enough to send me a full replacement at no charge. The one with the broken buckle has been housing my Macro kit, which has expanded in the last year. 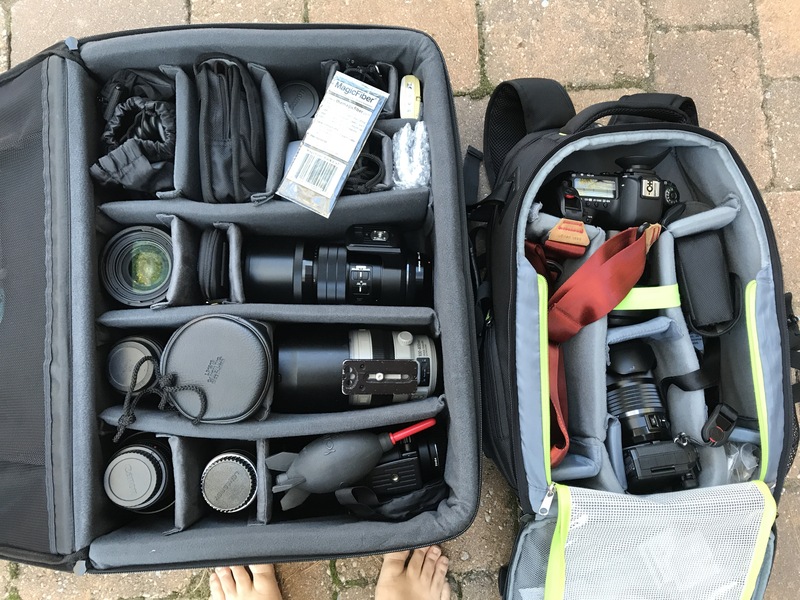 The other is my day-to-day bag and I can fit my Canon 5D Mark IV, 24-105mm and 100-400mm lens along with the Olympus OMD EM1 Mark II with the 12-100mm and 300mm lenses inside. My Canon 500mm prime with Canon 1DX always has had its own home in a makeshift bag I created with foam padding I got at the fabric store and a medium sized duffel bag from REI. It’s also amazingly tough and can handle the weight. I can insert the camera with lens attached, lens hood to the side along with a bag filled with the flash kit. But this is for local outings, not for any trip that involves public transportation. For international travel I depend on my Gura Gear Bag and I downscale my kit to two camera bodies, the 500mm, the 100-400mm and the 24-105mm lenses with accessories. This bag has now been replaced by the Tamrac G Elite G2 bag. If you are lucky, you might still find an older Gura Gear bag in green from old stock. But this doesn’t solve my every day problem. How can I organize all of my lenses in one place so that I know where they are? I had heard so much about the Think Tank Airport Security 2.0 bag, and I got one. Immediately I hated it. They have an awkward bottom inside and I can’t fit anything flush inside. Also, with just the 500mm lens it filled the bag with little extra room for other equipment. So that’ll be sold in quick order for someone with less gear. Finally I came across the affordable Vanguard Divider Bag which comes in three sizes. Of course, I purchased the largest one, and it didn’t take long for me to fill it to the brim. I still need room for camera bodies, let alone the 500mm lens. At least I know have a good storage solution which can also be placed into a regular 22 inch carry on rolling luggage bag that has expandable depth. I can also lighten the load in my day-to-day backpack and only carry what I need. I would love to hear from others as to how they try to solve this problem of storage. Surely there is some magical way to have it all. 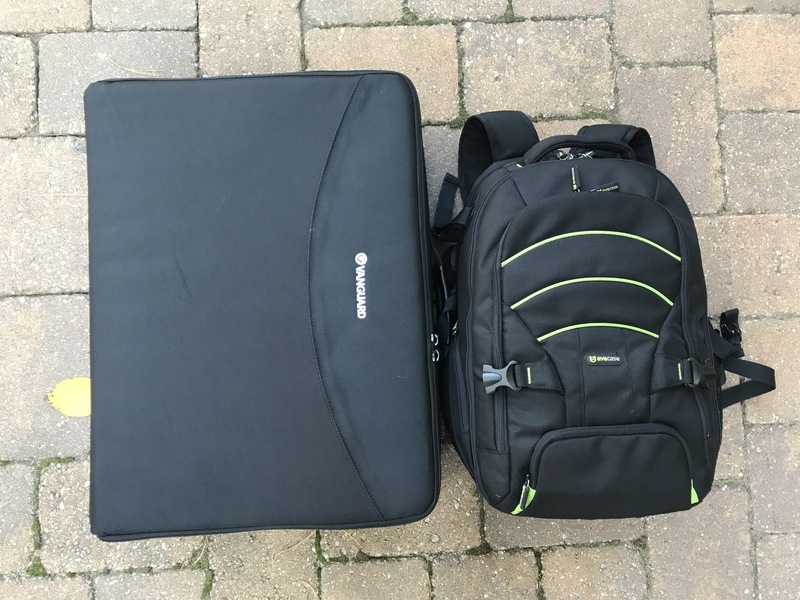 To store all my camera equipment in one place [I do have the same problems as you have] at home, and to have a convenient way to take all of it with me when I travel, I recently got a Lowepro Flipside 400AW backpack. As I don’t have as much equipment as you have, that is sufficient for me. When I’m out with my camera, I usually have only a small camera bag that holds just the Nikon D500 with one lens [Nikon 16-80mm Zoom, or Sigma 18-200mm Zoom, or Sigma 10-20mm Wide-Angle Zoom]. If I really want to take more than one lens, I can attach one lens case to that bag, or I put on a special belt onto which I can hook multiple lens cases if necessary. Ha ! My camera kit would laugh at your Lowepro. Actually there is a new gadget on the market called “The Lens Flipper” It might be a good solution for you. Well, when I saw your equipment, I was wondering if you needed a trailer when you’re travelling. 😉 But seriously: as I don’t have much of a camera equipment, but enough for my hobby purposes, and as I don’t really think I’ll be buying any additional stuff soon, that backpack iss exactly the size I need. Thanks for mentioning “lens flipper”. I think all photographers have the same problem – amateur or professional alike. Cho for sure does! There was one lady we saw who had her equipment in a rolling shopping tote. I bought the Amazon Basics bag. I don’t have nearly as much gear as anybody but this relatively inexperienced endive bag fits almost all of it. I take out the 150-600 for my travel trips. Gives me a nice pocket for other essentials for the laptop. I think you need a camel! I have come to realize that I live in a townhouse not a warehouse!